How is it possible to fly soundlessly? Owl feathers have a velvety surface that muffles the sound that is caused by friction, and the wing primaries with comb-like edges direct the air stream away from the wings. 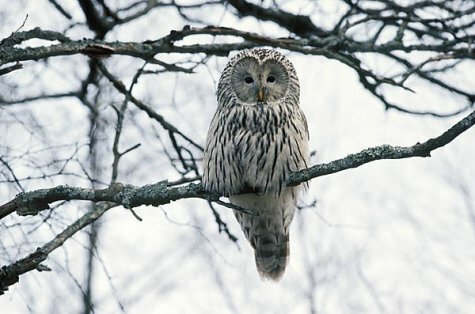 Even when you are very close there is nothing to be heard in “quiet“ weather except the silence, but see – the owl flies. The Ural owl is strong and sturdy, with a long body and a tail with lighter plumage. Dark eyes in the centre of the pale grey eye circles; yellow beak. Legs whitish, black talons. As shown by Arne’s photo, a master of camouflage. Earlier the birds only inhabited conifer forests, now they have adapted to the wooded meadows and mixed forests of West Estonia. They hunt at the outskirts of marshes or bogs, forest clearings, fields ... On the islands only erratic visitors have been seen. This year food problems are small due to the “mouse year“, so with luck up to five thousand Ural owls may stay here for winter.